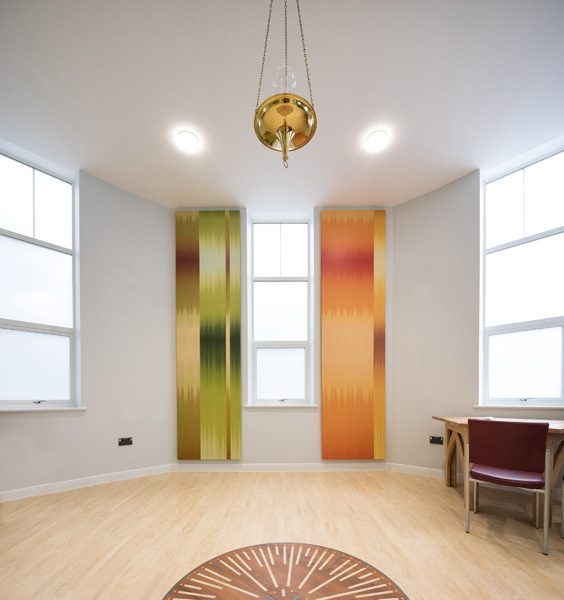 Willis Newson commissioned & collaborated with artist Ptolemy Mann to create designs for the new Sanctuary space at Bristol Royal Infirmary, making innovative use of sliding panel technology to create an interactive artwork. Willis Newson worked with University Hospitals Bristol NHS Foundation Trust to create a distinctive Sanctuary space as part of a major conversion and extension project within the Bristol Royal Infirmary. Stripping back to the original architecture dating from 1912 provided an opportunity for the Trust to create something truly special. The ambitious scheme includes major new artworks commissioned by Willis Newson, working in collaboration with the Trust, the hospital charity Above and Beyond, architects O’LearyGoss and consulting closely with patients, the hospital Chaplains and external faith groups. The watchword for the Trust was for the scheme to be inclusive without becoming bland, so we collaborated with textile artist Ptolemy Mann to create an innovative design solution which both answers the practical needs of the room, and is also a beautiful statement artwork, suitable for a contemplative space. A modern Sanctuary needs to cater for people of all faiths and none, so the design team were tasked with designing a new type of space, taking inspiration from religious buildings, but not duplicating existing single faith places. There are both practical and emotional considerations at play with the space. For example, some faith groups require separate spaces for men and women to congregate. Alternatively, a person of no faith might be seeking a moment of privacy and refuge from the hustle and bustle of the hospital and the emotional challenges it brings. 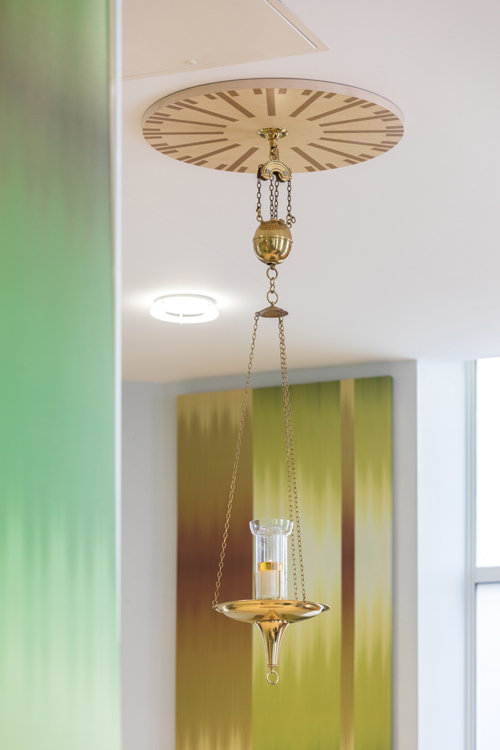 To develop the designs for the Sanctuary, we undertook creative consultation and engagement work with different faith groups, the Trust’s Chaplaincy team, patients and staff, funded by Above and Beyond. We believe that a good engagement process informs clear understanding of the needs of patients and staff, putting them at the heart of the design process. The suggestion from one of the Trust’s Chaplaincy team was to use blocks of colour to animate the room and so we developed this idea further throughout the creative consultation workshops, identifying a theme of nature, with colour references for sun, sea, sky and forest. Careful liaison and negotiation with the different groups using the room ensured that there was a direct line of communication with, and input from, the community, in order to create a sense of ownership and inclusivity. Having a shared visio,n informed by engagement, and working closely with the Chaplains, the Trust and O’LearyGoss, was crucial to ensuring the tracking system, lighting, ceiling and flooring features were integrated into the design from the earliest point possible. Ptolemy is a textile artist and an architectural colour consultant with a sophisticated understanding of colour theory and a lively, modern approach to hand-dyeing and weaving which made her ideal to answer this brief. The complex and culturally sensitive requirements of a Sanctuary space needed an innovative solution, so we worked together to create a bespoke installation for this multi-use, multi-faith room. The colourful interactive artwork consists of a system of moveable, floor-to-ceiling, woven fabric panels which repurpose existing sliding panel technology to display artworks. Using the language of colour and texture of woven cloth, these screens supply a practical means of offering a place where people of all faiths and none can feel comfortable. We knew that mimicking the architectural norms of a chapel, mosque or synagogue was not an option. Our goal was to create a new kind of space, one that was very contemporary in feel, spoke of quality and care and that made everyone feel welcome. We believe that the repurposing of the tried and tested Silent Gliss hanging system to display an interactive artwork has created a very dynamic, distinctive and welcoming space within the hospital and has also solved the problem of multi-faith rooms everywhere - cumbersome floor screens which are not very flexible and not easy to move around the space. 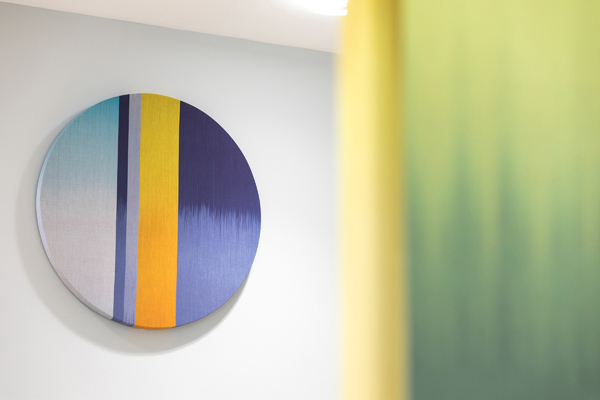 Ptolemy’s approach to the project included historical references to woven artworks in contemplative spaces, an appreciation of the ability of soft, acoustically-absorbent fabric installations to create the required distinctive, calm space within the busy hospital and a desire to use a wide range of colour to respond to a variety of emotional needs. The dramatic 4 metre high panels can be easily reconfigured by patients and staff, creating new juxtapositions and layers of colour which give different depths and moods to the room. We brought our expertise in integrating artwork into healthcare spaces, as well as our understanding of the latest digital print technologies to collaborate with Ptolemy on bringing her woven artworks to life in a digital print which is robust, compliant with infection control and easy to maintain. We managed the print and production of them to create robust and wipeable artwork panels mounted on Silent Gliss’ flexible Panel Glide track system in the ceiling. Also included in the new space are feature flooring with a compass motif inset, a matching ceiling rose (from which hangs a candle that was brought over from the old hospital chapel and which is always lit), two of Ptolemy’s original hand woven disk artworks and new oak furniture specially made by sustainable furniture-maker Jim Sharples. 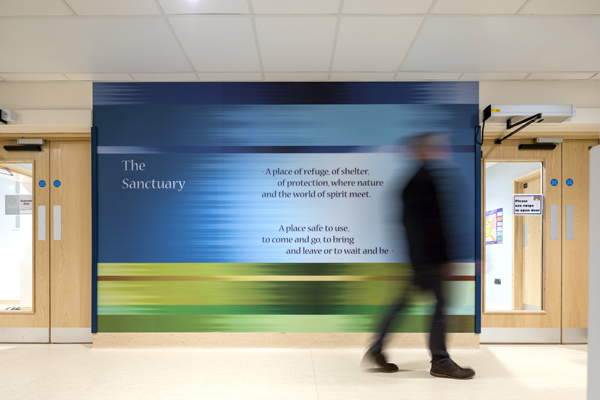 Announcing the entrance of the Sanctuary from the hospital corridor is a large welcome artwork panel, designed by Ptolemy and digitally printed onto wall protection using Acrovyns’ Imagine Technology to be long-lasting and hard-wearing. The final result of this collaborative, innovative and sensitive design process is a beautiful and practical room; a high quality space which makes a real impact, while remaining inclusive and welcoming to all. “This project was deeply collaborative and it wouldn’t have been possible to create without Willis Newson's expertise and experience in implementing a complex concept. It’s challenging, when there are several constraints around durability and function, to produce something transcendental and yet it felt like we achieved this goal together. Sanctuary and Faith is a complex and very personal subject for all of us – I hope this space is able to give comfort and inspiration when needed to anyone who might pass into it. Colour is a powerful and healing tool and available to us all and I firmly believe we should be using more of it in our lives."